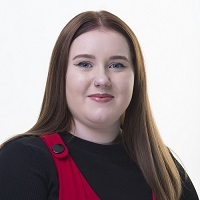 Chloe Galbraith joined Compass Associates in 2018 following a career in Beauty Therapy. Chloe places Care and Support workers across a number of disciplines within Health and Social Care across the UK with a primary focus on Elderly Care and Mental Health Hospitals. Chloe is well versed in understanding the demands of providers and the essential need to have a full compliment of staff. She has worked on many projects where recruiting in bulk (5-10 vacancies at any one time) required a prompt, precise and organised service. Thank you again for all your support which is truly appreciated. I feel truly blessed to have been assisted by yourself as you are so kind and have exceptional customer skills. I couldn’t be happier with the help I received from Chloe at Compass Associates, she helped me prepare and was with me supporting me every step of the way. I actually got the job I have wanted for a very long time and wouldn’t have made it through the interview process without her. Using Compass Associates has boosted my confidence and made me feel like I always have someone to talk to on the other end. The support I received through this was amazing and I even got a card congratulating me on my new job! Thank you Chloe for everything.